JERUSALEM/GENEVA 21 August 2015 (LWI) – The Lutheran World Federation (LWF) is among 31 aid, faith, human rights, and development organizations in Jerusalem calling on world leaders to take urgent action to halt ongoing demolitions and hold the Israeli government accountable for the wanton destruction of Palestinian property, as well as projects funded by international aid in the occupied West Bank. During a surge in demolitions this week, the Israeli army flattened at least 63 homes and basic structures across 10 Palestinian communities in Area C, the 60 percent of the West Bank where Israel has maintained full military and civil control. Among the demolished structures were 12 basic humanitarian necessities, including a solar panel, a portable latrine, animal pens, and tents financed by the European Union. In a joint statement today, the organizations urged international donors to seek to recover the financial costs of their destroyed structures from Israel and commit to resupplying the aid. The demolitions, which this week alone have rendered 132 people homeless including 82 children, account for a quarter of the displacements from demolitions in 2015, the highest such number in nearly three years. Affirming LWF’s support for the joint statement, the LWF Representative in Jerusalem Rev. Mark Brown said the recent surge neither contributes to promoting peace nor shows respect for human dignity. “The demolition of Palestinian homes and basic structures, such as animal pens and portable latrines instills fear, creates hardship, and undermines prospects for peace. 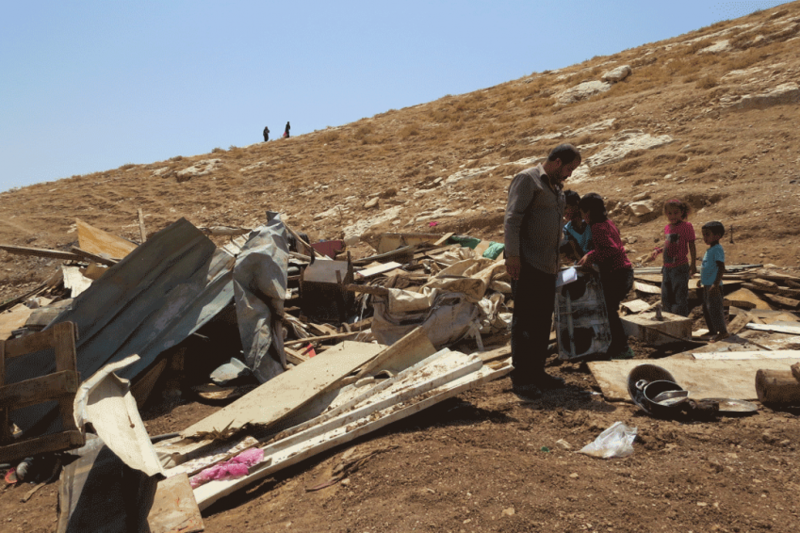 The bulldozing and confiscation of homes are acts of violence,” he added. Brown, who heads the LWF World Service regional program in Jerusalem, said it was critical for all parties concerned in the longstanding Israeli-Palestinian conflict to take concrete action to protect and preserve internationally-recognized human rights. At the June 2015 meeting of the LWF Council in Geneva, the governing body reiterated LWF’s continued support for a two-state solution between Israel and Palestine, along the 1967 borders, as the best way to ensure the security and well-being of both states. The call includes a demand for the cessation of all Israeli settlement activities in the occupied territories and a clear focus on the status of Jerusalem in all proposals to resolve the conflict, with special attention to the religious significance of the city. The LWF has been serving the needs of Palestinian refugees in the Palestinian Territories through its World Service program for more than 65 years. This includes provision of essential health care at the Augusta Victoria Hospital in East Jerusalem, vocational training, scholarships and material aid, and initiatives that promote justice, peace and reconciliation. The LWF member church, Evangelical Lutheran Church in Jordan and the Holy Land also provides education through its schools and promotes peace building.